Russia argues sanctions do not work and advocates negotiations instead. 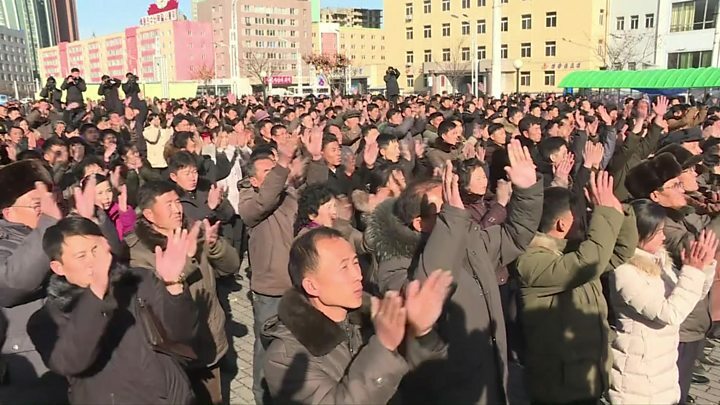 On Wednesday, the North tested its first missile in two months, saying the continental US was now within striking distance. However, defence experts have cast doubt on its ability to master the technology needed to launch a missile carrying a warhead capable of re-entering the Earth's atmosphere. What exactly did Lavrov say? Speaking on a visit to the Belarussian capital Minsk, Mr Lavrov asked whether America was actively seeking to destroy North Korea. "One gets the impression that everything has been done on purpose to make Kim Jong-un snap and carry out further inadvisable actions," he said. The Americans, he said, "should explain to us all what they're after". "If they want to find a pretext for destroying North Korea, as the US envoy said at the UN Security Council, then let them say it outright and let the supreme American leadership confirm it." Calling for new talks with North Korea, Mr Lavrov added: "We have already emphasised several times that the squeeze of sanctions has essentially come to an end, and that those resolutions which introduced the sanctions should have included a requirement to renew the political process, a requirement to renew talks. "But the Americans completely ignore this requirement and I consider this a big mistake." After China, Russia is one of the few states with which North Korea still has good relations. Both Russia and China wield a veto at the UN Security Council. What is the US position? Nikki Haley, the US envoy to the UN, urged all nations to cut diplomatic and trade ties. President Donald Trump asked his Chinese counterpart, Xi Jinping, to cut off oil supplies to the North. "We know the main driver of its [North Korea's] nuclear production is oil," said Ms Haley. "The major supplier of that oil is China." China is a historic ally and North Korea's most important trading partner, and Pyongyang is thought to depend on China for much of its oil supplies. Responding to the US request for an embargo, the Chinese foreign ministry said merely that the country had "always implemented full, comprehensive, serious and strict resolutions". Mr Trump used another tweet on Thursday morning to disparage the North Korean leader and cast doubt on Chinese efforts to restrain its ally. Existing UN sanctions limit oil exports to North Korea but fall short of an actual embargo. 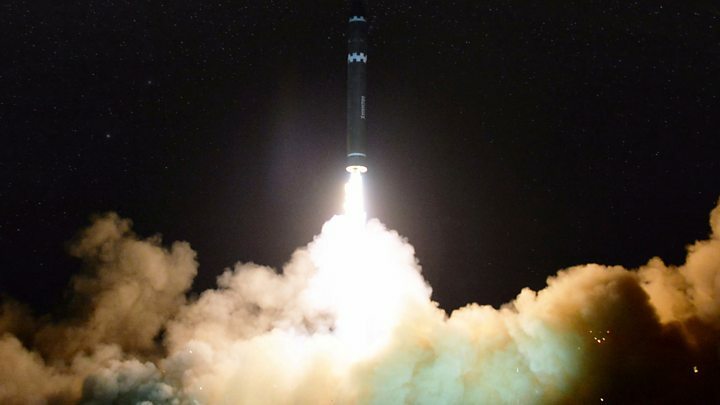 The Hwasong 15 missile launched on Wednesday flew higher than any other previously tested by the North before falling in Japanese waters. It says the rocket carried a warhead capable of re-entering the Earth's atmosphere. "They have extended the range now out to a point that it is hard to credibly argue that North Korea couldn't have the US eastern seaboard within its range," Vipin Narang, associate professor of political science at MIT, told the BBC. In September, North Korea said it had successfully tested a nuclear weapon that could be loaded on to a long-range missile. It was the country's sixth nuclear test since 2006.